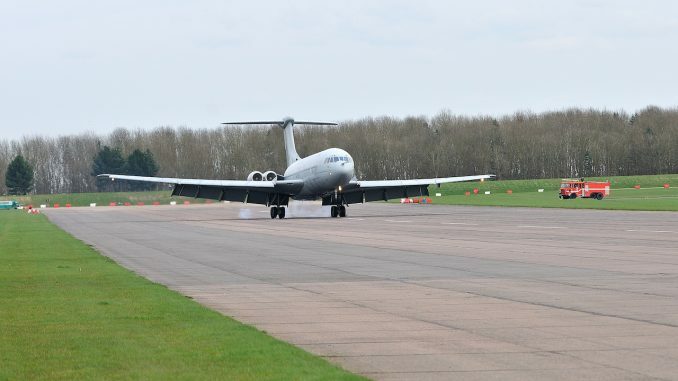 May 25th is a date to be noted, as it marks the debut for the Vickers VC10 fast taxi display at the Cold War Jets Open Day at Bruntingthorpe aerodrome in Leicestershire, England. The RAF finally retired the last of the breed in September 2013, and many of the surviving airframes came to Bruntingthorpe for spares recovery and eventual scrapping. However, one example joined the collection of classic ex-RAF jets based at the airfield and lovingly maintained by a dedicated band of talented volunteers. 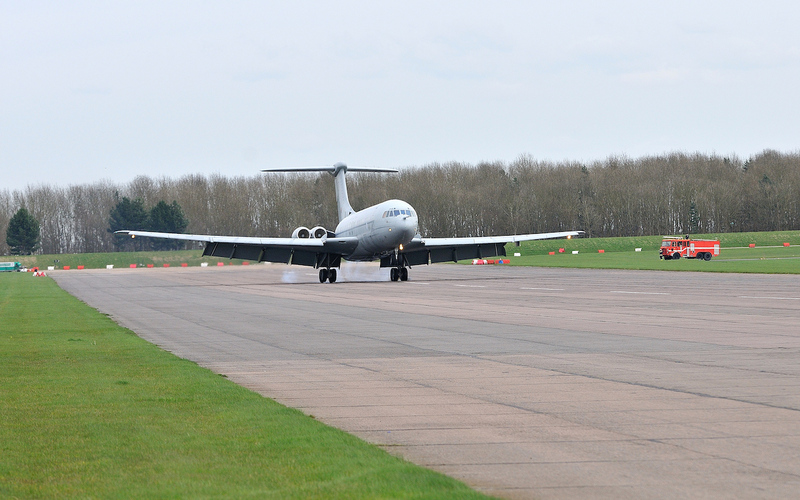 It is the very last operable VC10 in the world. Bruntingthorpe Aviation organizes two open days a year when the public can see the collection of “live” jets strut their stuff on the runway. During the event, which is a great day out for the entire family, the other resident aircraft (including the Nimrod, Comet, Lightning, Canberra, Buccaneer, Jet Provost, L29 Delphin and Hunter) will also perform spectacular “fast taxi” runs. They all played a significant role in keeping the peace during the Cold War, and this is about the only place in the world to see them move under their own power. The home-based aircraft will carry out spectacular high speed runs throughout the day along the aerodrome’s 10,000′ runway. Visitors will also have the opportunity to tour the cockpits of the other static aircraft in the collection, including the Super Guppy, Comet, Sea Vixen and Lightning. A wide range of souvenirs and memorabilia, including those of the Lightning Preservation Group and the Vulcan to the Sky Trust, will be available, in addition to hot and cold refreshments. It will be a fabulous day! Admission: Adults £15, Senior Citizens/Disabled £10 and children under 16 free. Please also see the main website HERE.